As technology has developed so has the sophistication of the con artist. Telephones, fax machines, computers, and wireless devices have become "tools of the trade" for fraudulent telemarketers who scam consumers and businesses out of billions of dollars annually. Legitimate businesses also use the same "tools" to sell their products, so consumers need to recognize the warning signs associated with fraudulent telemarketers. The links on this page provide more detailed information on how to avoid becoming a victim of telemarketing fraud, and what to do if you are a victim. You can also refer to information about the National Do Not Call Registry. 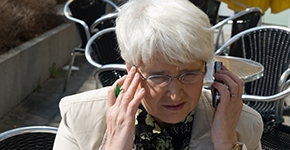 Fraudulent telemarketers attempt many of the same old schemes over and over again. For example, some will try to convince you that you have just won a prize or a contest. Some may want you to give to a charity. Others want you to buy a wide range of products such as magazine subscriptions, vitamins, vacations, lottery tickets, office supplies, club memberships and promotional items. Remember, these scams can come through email, text messages, or fax, not just over the phone. Does the caller refuse to give you time to make up your mind about the offer? Does the caller refuse to mail you information? Are you pressured for your credit card number? Do you have to pay to win a "free prize" or enter a "contest"? Does the caller offer to send a courier to your house to pick up money or a check? Are you buying something based only on what the person tells you? If you answered "yes" to any of these questions, the best advice is, HANG UP or DELETE the message! Consumers who wish to decrease the amount of unsolicited telemarketing calls they receive should register with the Federal Trade Commission's National Do Not Call Registry at www.donotcall.gov or by phone 1-888-382-1222. Telephone marketers and their service providers must honor the requests of consumers who have placed their telephone numbers on the Federal Trade Commission's national Do Not Call (DNC) Registry. Also, remember that unwanted telemarketing calls are often triggered by responding to unwanted paper junk mail. So reducing unwanted junk mail can lead to a reduction in the number of unwanted telemarketing calls. To reduce unwanted junk mail, register with DMA’s Mail Preference Service. Already Fallen Victim to a Telemarketing Scam? The good news is, you may be able to undo the damage. If the scam involves a telephone call, the unsolicited sale is not final until you've received written confirmation of the sale. Under state law, you have three days after you receive your written confirmation to cancel an unsolicited telemarketing sale. Cancellation notices must be sent by certified mail to the telemarketer's address. If the address is unknown, cancellation must be sent to the Department of Licensing, Business License Services, 405 Black Lake Place, Olympia, Washington 98504. Cancellation notices should include your name, address and telephone number. See the Department of Licensing’s rule for more information. If you paid with a credit card, do not pay for that item on your credit card bill until you've received, examined and are satisfied with your product or prize. You must write your credit card company within 60 days of receiving the bill to officially dispute the charges. REPORT IT! File a complaint with the Attorney General's Office. NCL's Fraud.org, c/o National Consumers League, 1701 K Street, NW, Suite 1200, Washington, DC 20006. Add your phone number to the National Do Not Call Registry. This will reduce the chance that you will be contacted again and again as your name is sold to other scam artists.